YARMOUTH -- Evelyn King has tied flies for more than 20 years. But two decades of hackle and bucktail doesn't guarantee the company and conversation you get in a fly tying class. YARMOUTH — Evelyn King has tied flies for more than 20 years. But two decades of hackle and bucktail doesn’t guarantee the company and conversation you get in a fly tying class. So King still stops twice a month after work at the Grey Ghosts Fly Tying Club class in Yarmouth on her way home to Harpswell. The instructors share new fly tying tricks. The fishermen share a common spirit. “It used to kind of be a loose-knit group of guys who got together. I don’t think it was promoted really well. But when I took it over I’ve used online fishing forums to reach the fishing community. Last year we had one right before Christmas. I didn’t expect much interest but there was. We have some new people every session,” said Grey Ghost director and Registered Maine Guide Greg Bostater. 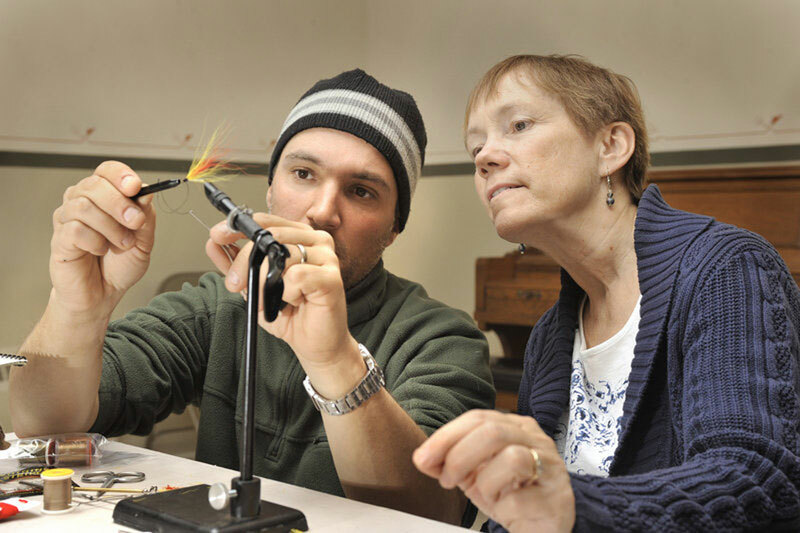 The Grey Ghost Fly Tying Class is one of the few in the state that is completely free. The classes are geared for beginners and intermediates. And after growing to as many as 20 and 30 in the past several years, the burgeoning class is about to go high-tech, and maybe even viral. Bostater is filming this winter’s classes, and the online forum Fly Fishing In Maine (www.flyfishinginmaine.com) will post them by the end of the year. 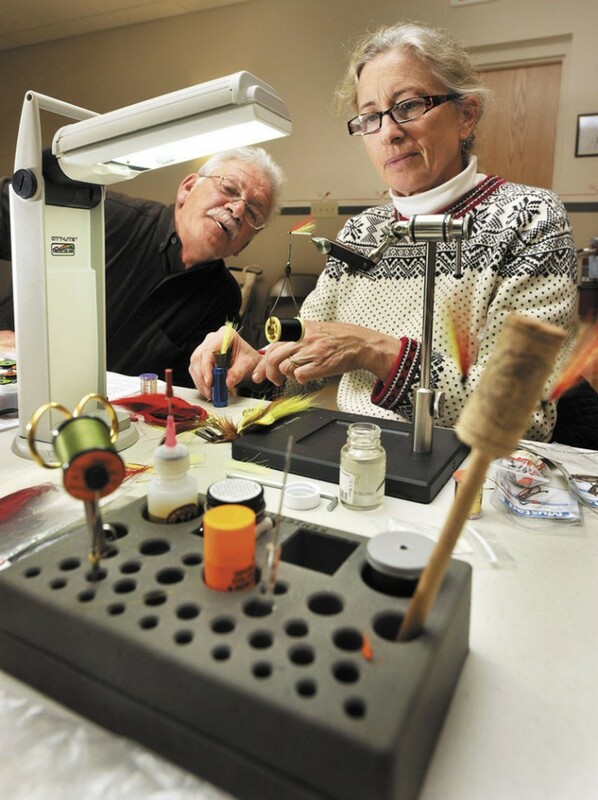 Elsewhere in Maine, such taped fly tying classes are finding an Internet audience. Kevin McKay has posted fly tying instruction on his Maine Internet fishing site, www.maineflyfish.com. Those Maine fly tying classes have gotten as many as 20,000 hits. McKay’s video of a Mickey Finn being tied has 11,000 hits; the Wooly Bugger clip has gotten 24,300 hits; and the Hare’s Ear Nymph a good 31,250. But the Grey Ghost class sponsored by Trout Unlimited may have the crowds because it’s free. Materials are donated, vices loaned out, and experts teach and mentor. And McKay and Bostater agree, the videos are no substitute for hands-on instruction or the back-and-forth that is common in a room full of fishermen. At the Grey Ghost class recently, King and Lane Soltesz swapped stories and tips. Soltesz, a fishermen for 40 years, claimed he leaves every class with better insight into making bugs on hooks. Now he’s hooked. “It’s a kick to catch a trout on your own fly,” he said. And even the website administrator about to receive the detailed, instructional Grey Ghost videos thinks spreading the fly tying enthusiasm through classroom work leads to more avid tiers. “To me it doesn’t replace the classes. It creates more options to learn. I could see it getting more people into it. It’s a step up from looking at pictures that show it step by step,” said Dan Tarkinson, creator of the Fly Fishing In Maine site.